William S. Braintree lives and composes his brand of glitchy, melodic IDM in San Francisco, CA, one of the most populous cities in the United States. Much like San Francisco, his new release "This Is Story" is densely packed full of variety that co-exists harmoniously in the small span of an album. The first sound you hear when you press play is the crackle and pop of a vinyl record, followed by a vintage recording from what I would guess to be some sort of self-help or relaxation album. "I recommend that you listen to this record in the evening before you retire. Have your wife and loved ones listen too so that good, constructive thoughts are impregnated in your consciousness just before you go to sleep." 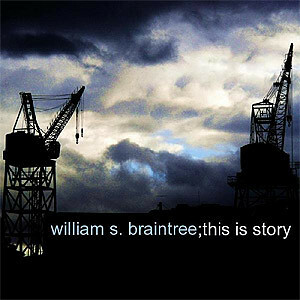 It's true, William S. Braintree has completed a collection of tracks that are both stimulating and uplifting, though they may make you want to jump out of the lounge chair to dance. Said to appeal to Team Doyobi or HCCBU-era Venetian Snares fans, Braintree's sound pallet knows no limit. Tracks like "Space Birds" and "Koala March Invasion" feature classic glitchy digital percussion, warm, resonant bass, and modern synths while "Boris Karloff Is Racist" dips into a world percussion soundbank full of tabla drums and finger cymbals. He also weaves in some older squarewave tones like on "Glass Joe", an 8-bit dirge that morphs into what I can only describe as sort of "chip-grime" with a loud, melodic breakdown that demands your attention. One could say that a collection of such varied tracks make an album sound "disjointed", but who cares? When it's good, it's good, and that's exactly what "This Is Story" is. One of my favorite tracks is "Burning Sand", a funky stepper which opens with a warm and snuggly arpeggiated bass synth. I had a few questions for William S. Braintree and he graciously obliged. Bc: Did you start these tracks after your "a very abbrev xmas" last year or do some of them date further back than that? WSB: Some of them were written much before, and some were written a few months afterward. That xmas EP was written in about a week's time, actually. Bc: What is your hardware/softsynth ratio? What is your favorite of those to work with? WSB: Most of the album is written with software, but I have an Electribe ESX that's on a track or two. I really have no preference when it comes to hardware or software. I write music with a group from Columbus, OH [pinebox.org] that uses 99% hardware, and I'm completely comfortable working with it as if it were software. Sometimes MIDI can be a pain, but it's usually not an issue. Bc: What do you use for your lo-fi sounds? Like in Glass Joe for example. It sounds a lot like C64 or a toy keyboard. Do you use samples or do you have some of that dusty old gear lying around? WSB: Some of them are definitely samples from old Nintendo, Amiga, or C64 games, and some of them are random samples I send through a bitcrusher/decimator. On Glass Joe, I actually wrote some of those patches in an FM softsynth. I prefer to get samples right from the source, but sometimes you have to improvise if you don't have them on hand. Bc: Any plans to tour a bit or maybe some local live shows? WSB: I don't have any plans for a tour, but I'm always playing shows in San Francisco and the bay area. Bc: Do you feel like living in the city of San Francisco influences or inspires your music at all? WSB: Maybe not directly, but I do think that your environment has a heavy impact on your creativity. This city is amazing, and I hope to stay here a long time. All of the crazy events here [Howeird festival, Bay to Breakers, Love fest, etc.] really make me happy, and inspire me to be very active. So in that sense, San Francisco definitely has a profound influence on me. Bc: What is your favorite pub or bar & grill in SF? WSB: There are so many! Noc Noc has great music and beer, Zeitgeist has a huge patio outside, and the Bean Bag Cafe has super cheap, good beers. Also, Bender's since they have bike hooks inside and two pool tables, haha.